Happy Tuesday, and welcome to the 10th day of the 31 Day Challenge! I can't believe I'm made it this far without missing a day. It's been exhausting some nights, especially with my busy fulltime mom schedule, but I'm glad that I've persevered. I'm a third of the way through with 20 more to go! Today's challenge is gradients, which I've done my fair share of in the past. I decided to revisit the dusk sunset gradient with Sinful Colors Shock And Awe, Boogie Nights, and China Glaze Lemon Fizz. 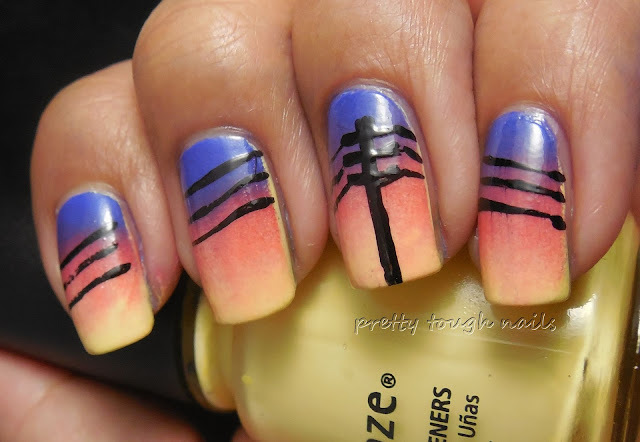 On this landscape, I painted a telephone pole with the wires stretching across all the nails with two birds on the thumb. It was simple to do but striking with the inclusion of the omnipresent telephone pole. It reminds me of one of those gorgeous pictures that always accidentally includes a telephone pole simply because they're unavoidable, stretching across all landscapes in all neighborhoods and settings. I'm looking forward to seeing the rest of the ladies' interpretations of today's challenge, so please stop by and see what they have created for today! This is a beautiful sunset gradient, love it! thank you!! i always see this color combination and finally gave it a try! 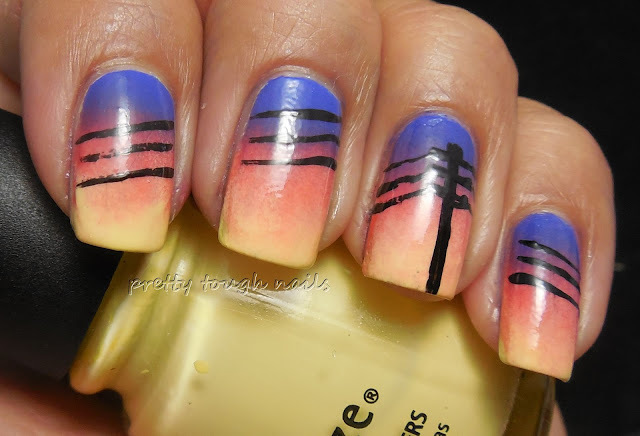 Really love this - I never would have though to put in the phone lines - but that's exactly how I see my sunsets ever night the fog is not rolled in...I live in a beach town that is older and we still have all the phone lines and utility lines above ground. I don't even see them but I know folks who live in areas with all underground lines, they think this is an eye sore! 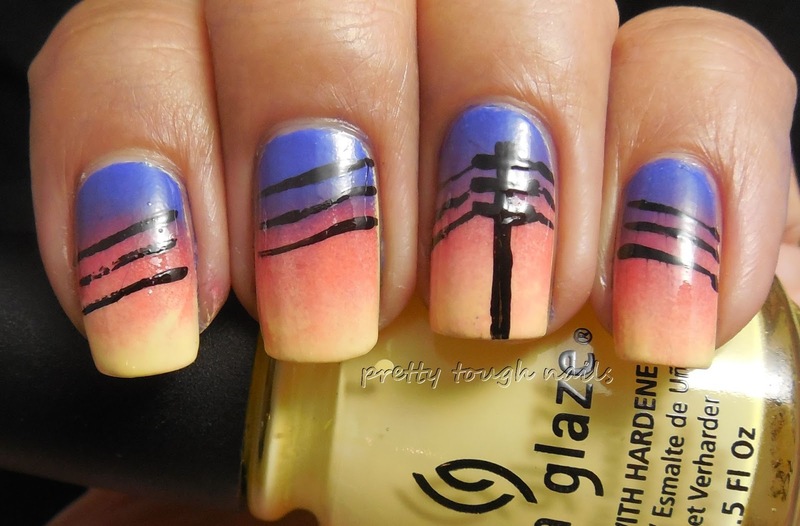 Your colors are lovely...and wow...your freehand work is just great! Oh, by the way - it would be great if you would add a follow via email option other then what one can configure via Bloglovin - I so dislike bloglovin - they come in a bulk email a day or more late and often on their email/dashboard they don't feature the thumbnail that is going to tell you if this is anything you want to move off and have to pull up yet another web page open to look at...it's tedious and often when the have a bank of servers down and my subscription is one in that mess it lasts for a long time. I know a lot of folks have moved to following as many blogs as they can they read to email...it always works no matter what device or platform you are using where as lots of the RSS readers and dashboards don't. Thanks for the suggestion!! I just updated my sidebar! So so cool! 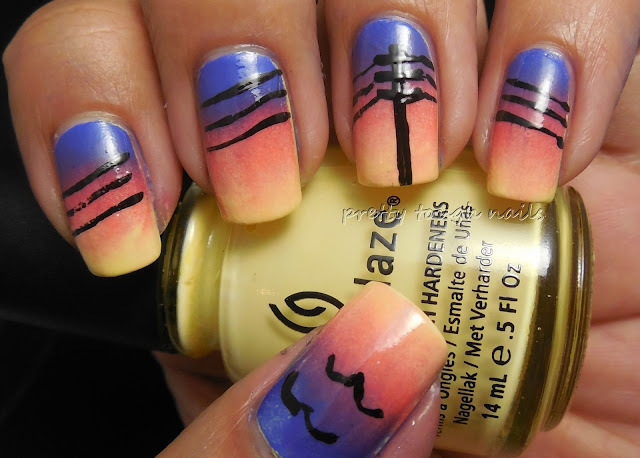 So creative, I love! thank you!! I really like this one too.